I didn’t grow up in a Christian home nor did I take the righteous route when it comes to my husband and I’s courtship story. Being married to such a wonderful man of God was completely Gods favor in both our lives. When we met we were both two wretched souls lost without Jesus. We both accepted Christ together and was later baptized together. I know how blessed I am to be my husbands wife and how God made him the man he is today because of His grace and our willingness to follow him. In spite of Gods favor we had to atone for past choices. Our iniquities wreaked havoc on our marriage for the first 7 years until we had come full circle. I write a lot about how I’ve grown as a wife and how my obedience to God has helped my husband become the man he is today. Today I want to share the end result of my husband’s faithfulness to God. I don’t want you to spend the first 7 years of marriage trying to make your husband the man God wants him to be. Instead, search the scripture to see what kind of man God desires for His daughters and begin to seek out those character traits as you wait on, prepare for and seek out the man God has for you. 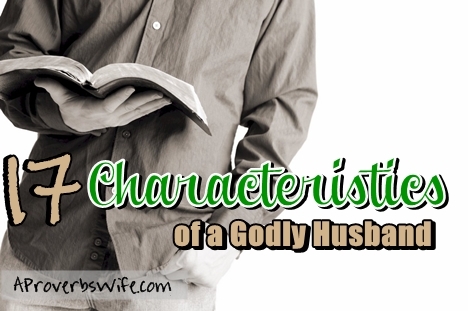 Below you’ll find 17 Characteristics of a Godly Husband all based on Gods word. He diligently read it every day, studies it, delights in it, meditates on it, prefers it, loves its reproof and counsel, talks about it, hides it, defends it and prefers it above other things most precious, whether written or preached and its promises are all sweetness and marrow to him. He lets the person of God transform him by the glorious truths God has revealed in this world, and brings God’s goodness into the life of the undeserving. Gal 2:20 – I am crucified with Christ: nevertheless I live; yet not I, but Christ liveth in me: and the life which I now live in the flesh I live by the faith of the Son of God, who loved me, and gave himself for me. Matt 7:21 – Not every one that saith unto me, Lord, Lord, shall enter into the kingdom of heaven; but he that doeth the will of my Father which is in heaven. 1 Timothy 4:12 – …but be thou an example of the believers, in word, in conversation, in charity, in spirit, in faith, in purity. Was looking up the scriptures and became confused on tying faithful to Matt 25:11.
i love this list – thank you so much for the all the verses to back it up! A beautiful reminder! Thank you for it. Be blessed abundantly in your marriage.